I have always favored style over fashion. The fashion industry is fascinating, and it is powerful. It sets trends not unlike movements in the art world. These trends respond to the world in which we live, as the industry recognizes and then propagates the styles of a few inspired people who play with new ideas/themes (think grunge). At the same time, there are those who sashay to the beat of a different drummer. They have a personal style rather than slavishly adhering to fashion dictates. This post is about people who seem to enjoy playing with the rules to express something unique: their very own style. I am fascinated by people who bend, adapt and interpret trends and fashion norms to fit their own tastes, whose apparel is selected and combined as a work of art. The palette of each outfit suits their coloring, and cuts fit to flatter the body. 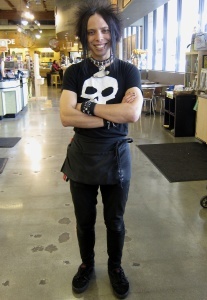 Then there are those who seem to totally disregard current fashion trends and display something nearly theatrical. They also receive my appreciation and admiration for their bravery in going against the grain or for the artistry of their presentation. The woman above graciously posed for me at work in this delightful retro ensemble. Doesn’t she look like the iconic bicep flexing woman in the 1940’s “We Can Do It!” poster – after she put on something to paint the town red? I absolutely delighted in spotting that satin flower in her hair. In some settings we are obliged to reflect the style of our work subculture. 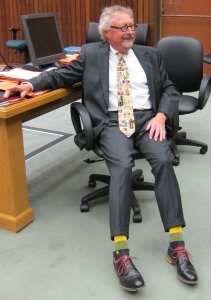 In court, it means a tie for men and business suits for both men and women. In the high tech world of Silicon Valley, wearing a business suit even to an interview is professional suicide. Dark blue jeans with a button down shirt is much more acceptable. Yet even in those environments, we can still strive to be playful and authentic in portraying a personal style. I don’t recall a singe day in which my coworker Jon has worn monotone socks or an ordinary tie. Love it! This woman runs a shop of jewelry and gifts in the real Bellagio (Italy). I love her ballerina-like ensemble, which reflects an attention to detail – check out the shoes! – and appreciation for current trends (also seen in her store inventory). The outfit has a subdued but artistic flair. It nicely matches her coloring and fits her body shape. I don’t think I would find it as appealing on a much taller or curvier woman. This gentleman works in laid back Santa Cruz, California and was engaged in his morning walk when I flagged him down this week for a photo. I was drawn in by his shoes which are open in the back. He relayed that they were handmade in New Zealand and are extremely comfortable. Once he gets back to the office, he can just slip them off. They work well with this very casual – but sufficiently neat – work outfit of khakis and untucked button down shirt. I was really impressed with the way the woman pictured above combined Birkenstocks, a short dress, sporty sunglasses and most notably, a low slung metallic fanny pack. Yes, fanny pack! And it works, don’t you think? I featured her my last post about the Birky ad low heeled sandals but felt she deserves a place here as well. It isn’t easy pulling off an ensemble which is both sporty and stylish. It is just the thing for serious urban hiking. What can I say? I simply adore the dark blue sneakers with this short filmy flower print dress. The woman pictured above is like a brilliant blossom of Indian summer. 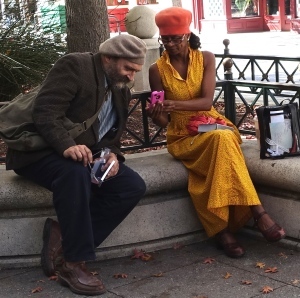 The vivid yellow and red maxi dress with papaya-colored tall beret – even the bright pink phone case – are so beautiful next to her skin tone, while the cut of the dress showcases her lithe figure. 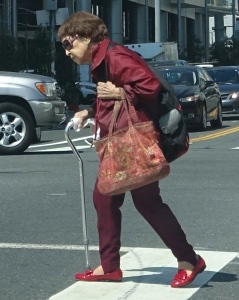 The woman in the photo above proves that you can rock red at any age! I love the mixture here of different shades/tones. I would not have thought to combine dark crimson with bright red, but hey, it looks great on this lady! With any creative endeavor, something truly great requires experimentation…in other words, playing. The looks above are wonderfully whimsical and tongue-in-cheek (it seems). I wouldn’t expect to see this on a runway or fashion blog, but it is certainly engaging. Bravo to these young men for expressing themselves in their own ways! Just check out the details in this woman’s carefully chosen ensemble: the bright pink coat with white fur collar, silk scarf around her waist, white dress, light colored hosiery and shiny metallic cage sandals. As I spotted her in Union Square, San Francisco a few weeks ago, a smile instantly came to my face. She is something! The woman pictured above illustrated in a previous post one of my biggest pet-peeves: yoga pants wearing (ugh! ), but I have to confess that I have never seen the things worn with such panache. She almost reminds me of a botanist surveying a waist-high field of flowers. But then, what else should you expect directly in front of Saks on Union Square? The young woman featured above somehow combines multiple articles of clothing, each with a very defined pattern: checks, plaid and polka dots. She combines black and white, with blue and white, with black and blue…with black, blue and white. 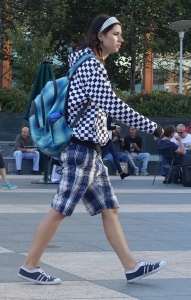 Even with all that going on, the colors and patterns in this perhaps modern art approach to dressing – am I projecting? – is not jarring, but rather worthy of notice, in my point of view. If that weren’t interesting enough, the outfit is also totally androgynous. This next young woman seriously piqued my curiosity when I saw her the weekend before last. Why do you suppose she is dressed in this vintage French schoolgirl uniform? She almost looks lost…in thought perhaps? The collar is impeccably crisp, the bow, perfection. Her pristinely clean, polished mary janes have leather bows on top. And her handbag is most unique. It looks like a heart-shaped box of chocolates; the cursive script on it reads “Angelic Pretty“. Quite fitting! 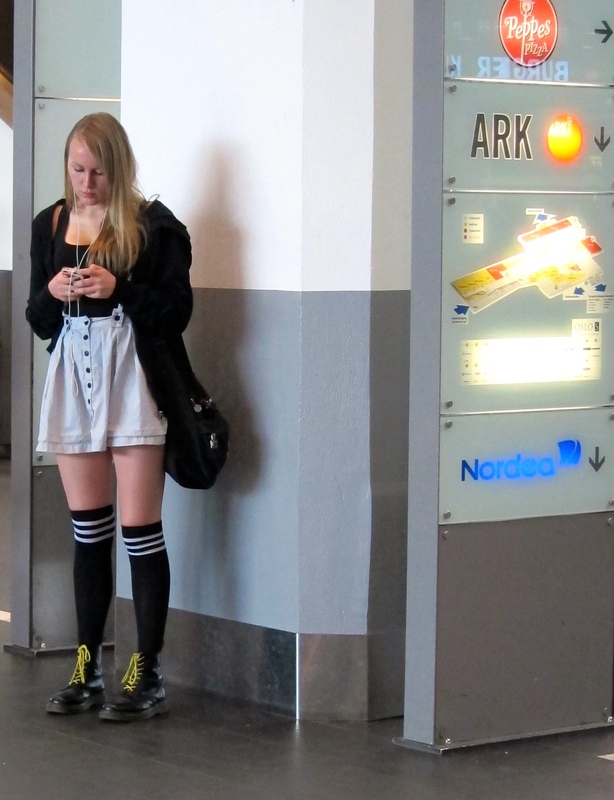 I spotted the young woman pictured above at Oslo Central Station last July. The mini skirt seems to have suspenders, which can only lead me to believe that this is a thrift store diva. I love the retro roller derby look with above-the-knee striped knee socks and Doc Martinesque combat boots with contrasting laces. 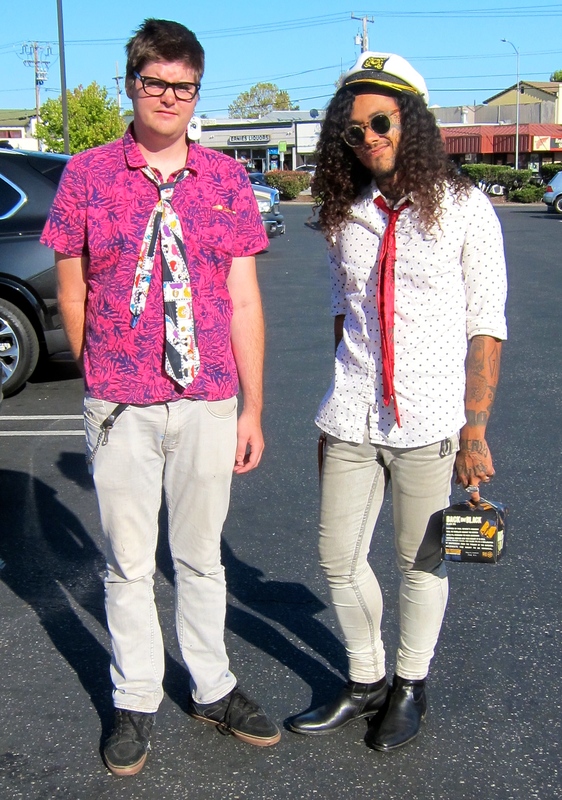 The looks above and below were featured in a post about Santa Cruz style. Tattoos and piercings are not my thing, but I can appreciate the guts it takes to pull off these looks. I do like black! The young woman shown below takes the cake. I can only attempt to describe the look as “anime goth“. She was quite an eye-full at the Oslo Central Station. I can only wonder how many pieces like this she has in her closet. You really must scan her carefully from head to toe to appreciate the masterpiece. I am sure she custom-ripped both layers of hosiery along with the left side of her shorts and suspect she also cut and frayed her own sleeve holes. Do you think she added the fur to her boots? It reminds me of panels of fake fur I saw placed on folding slat chairs in outdoor cafes along Karl Johans gate. There was definitely some thought put into this ensemble. How about “anime goth ice princess”? In what Bill Cunningham refers to as a cookie cutter era, it is great to see people who are willing to reflect their own personal style. Sure, some of us could hire a personal shopper to guess at “our” style and then display that to the world. But how real is it? And more importantly, how satisfying? I am more inspired and sometimes even delighted when I spot someone who doesn’t quite pull off a daring ensemble as opposed to someone tastefully dressed like everyone else. As for a person who dresses according to another’s whims or rules, I believe most people have the innate desire to be seen for who they are and appreciated for that. I simply relish the experience of observing those whose apparel illustrates authenticity, playfulness, intelligence and true creativity. I hope you’ve enjoyed this handful of examples as much as I have.